Bring the most popular Christmas colors – red and green – to put the yuletide theme on your wedding. Use white-colored wedding invites. Better yet, use indigenous materials like sinamay or abaca for the invites. 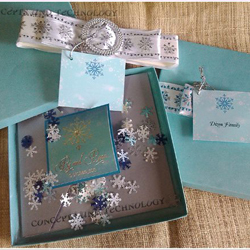 Hint at your wedding theme by decorating your invites with Pinoy Christmas symbols. Wear a Filipiniana-inspired wedding dress. Or, you may use indigenous materials to complement the Pinoy theme. Your groom and entourage ensemble should follow suit. You and your entourage may carry the traditional bouquet. Or if you want to try something unconventional, you may have your entourage carry gifts, foods and rosaries. During December, churches would already be decorated with Christmas ornaments. You may just use a combination of flowers and miniature Christmas lanterns (parols) to add decoration to the aisle. 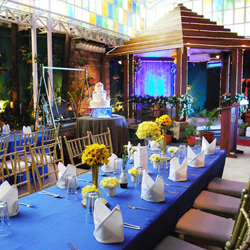 Your guests, entourage may throw assorted colors of petal flowers or rice and coins for good luck. It would be nice if you can have native furniture for the reception. However, if these are difficult to source, cover the tables instead with white cloth. Use indigenous materials as an added design. Decorate the back of the chairs with same materials. You may use banana leaves or abaca as placemats, complemented with same materials to tie white table napkins. 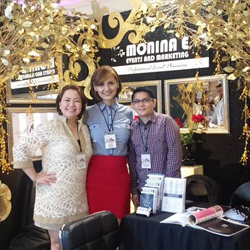 Serve Pinoy Christmas fare. For drinks, you can serve local wine. 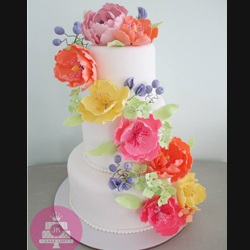 Your wedding cake should be all white, decorated with either local flowers, fruits or local Christmas ornaments. Edible items like local fruits, kesong puti, tsokolate, and rice goodies. Use indigenous materials as wrapper and Christmas ornaments as trimmings. Christmas Details. 2000 Mary Norden.